Top & Best Question - Answer Community Websites for Help. Home » Blog » Education » Top & Best Question – Answer Community Websites for Help. 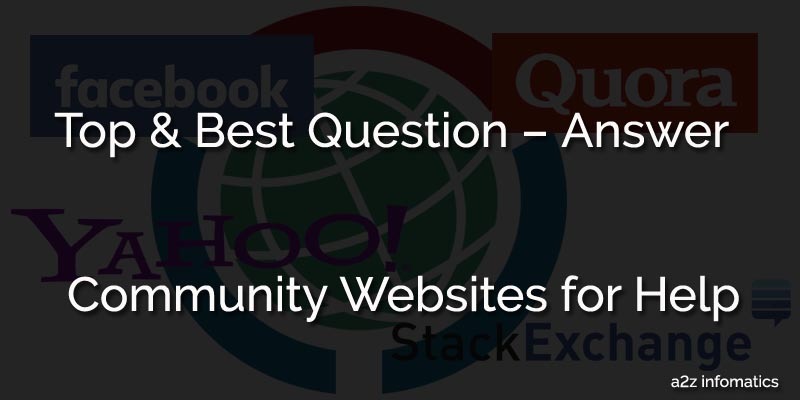 Top & Best Question – Answer Community Websites for Help. Don’t you think, Life is very short and all about experimenting and improving the skills. In simple words, it’s about learning within the allotted time. Actually, these are the only mantras to enjoy the LIFE at it most. For every here and there, Life will show you many ups and many downs. Then what ?, it’s the part of this lovely game known as LIFE. People, smile when they taste success and cry while facing the failures. Why don’t we take in this way, that failures is just the start towards the success. Have you heard anybody’s success story, they never feel shy to declare that they have started with some failures. Remind them, be ready to write another success story of your’s by improving all the required skills. For this, you have have to study hard. On this journey, you may face some problems and have some doubts in your mind, never feel upset about it as the whole internet community is here to help you in almost any cause. Actually, Today we are here to share some Online Community Websites with you, from where you can get all the answers for your questions. Remember, those were the old days when BOOKS are the prime source for gathering any knowledge. In today’s modern world, almost every information is just a click away in the form of community websites, offcouse YES, they are free too. Why to use Online Community Websites ? While experimenting or learning, a person is surrounded by many doubts and confusions in the mind. What to do in these circumstances?. To waste hundreds of hours, in searching the books for any particular solution / answer and get settled with nothing. To find any professional to help you, Where ???. Suppose you are learning JAVA programming and stucked somewhere in the code, Can you tell the source from where you will get the contact info of this JAVA professional who will sort this out for you. Forget about the advertisements, we just need some help, not offering any small job. Believe or not, the option left is to go online. Yes, these online community websites are full of masterminds, who can help you within minutes. Don’t you think, this is the best option to get help at the rate of FREE. Here, you never have to worry about anything. There are thousands of community websites / forums available to help you with any of your question / problem. Yes, Forums also are the type of these community website from where you can expect help too. You just have to post your detailed problem over there and hundreds if not thousands people will come and provide their views about your query. We bet, you will be surprised once you try any of these community websites to solve any of your problem. For any TRIAL, just post any general question over there and check the response yourself. Which community website is the best to use ? Million Dollar Question, we can’t use each and every of them as it will consume a lot of time. The best answer for this will be, to go for quality community websites defined by the internet community. Nothing is hidden over here on the internet, you can easily search for the best community website related to your query. It’s always important to ask the right question at right community place, you can’t ask the men related problem at any women related community website. No worries, we are making it some easier for you by providing some quality community websites over here, where you can sort out almost any of your problem. A)- First on the list is, Facebook Groups. Actually, the majority of the population is just using this great social platform to share their happenings or for time-pass only. Many use Facebook for their FUN. To tell you the truth, we never has taken it in this way. For us, Facebook is the greatest place on the web to connect with others and sharing the stuff with them. Don’t you think this include sharing the knowledge too. You just need to interact with the members with the similar interest as of you. How to utilize Facebook to get help ? Facebook Profiles- Here you can share your daily happenings, share your pictures and inform others about your current status etc etc. Facebook Pages- This feature is used to promote your brand of any type. Facebook Groups- Here comes the main one, which we will exploit TODAY to get unlimited help for our problems. The main reason, to include Facebook Groups to this list is due to the heavy traffic, Facebook receive daily. Due to this heavy traffic they receive, chances to get a quick help are much higher. Here, you again have two options. To start your own group OR to join others groups. For any urgent help, we will always recommend you to join other’s established Facebook groups related to your subject and get it done. You can start your own group too, but it will take time to establish that group. You can create a Facebook group anytime, it’s only a two minute process. How-to Join Facebook Groups ? Public Group: Anybody can JOIN. Closed Group: Anybody can REQUEST to join, have to wait for the confirmation of the membership from the ADMIN of that group. Secret Group: As the name suggest, forget about it 🙂 . So our target will be to find Public or Closed Facebook Groups related to the subject. It’s very easy, use Facebook search box to find them. Suppose, any problem in your ANDROID phone is ditching you from last few days and you were unable to solve that. Simply search “Android Phone” in Facebook search box. It will show you many public / closed groups in the results. Join or send request to join to these groups, Post your detailed query over there and get it done within a short period of time. Isn’t that’s too easy which you are ignoring earlier. So how’s that about finding a great place to get help, from the scratch. Let’s Join some of them. 2)- Second on the list is, Quora. We love their tagline “The best answer to any question“, which truly satisfy with their service. Quora is among one of the most loved community place. It has been founded / launched in June, 2009, but was made available for the general public in June, 2010. Within 6 years of time, this community place has collected a lot of fame and has become the major place for discussion. In accordance to some sources, Quora is giving a very tough competition to “Stack Exchange” & the Old Giant “Yahoo Answers”. Actually, it’s very easy. You can access QUORA, using your Google Account, Twitter or Facebook credentials. Respective service may ask you confirm this action by permitting QUORA’s application to access your account information at google, facebook or twitter. In addition to these logging options, you can anytime create a separate account with QUORA using your email address and the other required information at their website. After signing into QUORA, you’ll be then moved to the “Top Stories” page where you will have the option to follow any related topic. You can also search any desired topic by using the search box available there. About your problems / questions, you can use the “Ask Question” tab at the TOP. While searching for any desired answer, you may find a TAB saying “Write Answer” there, for the sake of this community please write your’s if you know any. This will just build a strong reputation of your’s over there, which you will definitely taste in the future goings. Important: While searching the solutions for your problem, Always do make a search to check if that has been already answered somewhere. If found nothing, go ahead and post a new one. QUORA is available for every mobile platform too. You can download QUORA mobile app from respective app download location. This will provide you the instant access to QUORA using your mobile phones. Here you can also save the topics for any future readings. So, waiting for what ? Visit Quora NOW. 3)- Here it comes, the oldest among all, Yahoo Answers. Yahoo Answers is the official community place of the famous search engine, YAHOO. This oldest community website has came in the existence right back in YEAR 2005. This launch of Yahoo Answers has been made to replace Ask Yahoo (Previous Yahoo Community place), which later has been removed in the year 2006. We don’t know the reason BUT there is a sudden drop in Yahoo Answers Popularity within last few years. People are switching to other alternate options for their needs. By remembering the “OLD is GOLD” tag line, we still think, it’s the place to look out for any real help. To tell you the truth we had used it many times with many great results, and only due to this reason we have included it in this list. They also have the point system for their users. For easy understanding, you can earn points over there by answering other’s questions, later you can redeem these collected points by asking questions from the community. We love this system as it always motivate to participate. The good thing is that, you don’t need to be logged in to view Yahoo Answers. Logged in necessity only applies when you are willing to put any question OR want to answer somebody at the Yahoo Community. Unfortunately, at present they are not offering any mobile app for their users. You can only visit the Yahoo Community direct from your phone’s browser. We hope they will introduce their Yahoo Community Mobile app very very soon to attract mobile users. Have a visit to this OLD Community giant, the Yahoo Answers. 4)- Last on the list but actually TOP in the competition, the Stack Exchange. At last but not the least, here comes the leader among all the community places, we love it too 🙂 . In simple words, Stack Exchange is the goldmine of knowledge, covering variety of topics. Here you can move from education to politics & from computers to auto-mobiles. They haven’t missed any important topic. How-to join the Stack Exchange. The process to get into Stack Exchange is almost the same as of QUORA. They just have left out logging through twitter credentials and have included to use Yahoo credentials to log into it. After logging in, you have to maintain your profile by providing all the requested information and that’s it. Here at Stack Exchange, to encourage the participation they have a point system there. Members can earn unlimited number of points while answering to other’s questions or by participating in different activities on the website. All the collected points will be added to your profile stats, which indicates the level of your reputation at Stack Exchange. Stack Exchange has maintained different sub-domains for different topic, like for ANROID related subject, they have the category “Android Enthusiasts” which can be accessed by visiting “http://android.stackexchange.com/”. Note: You don’t have to go to any category specific sub-domain. Just search your topic in the main search box at their root domain, they will redirect you themselves to the respective location. You don’t even have to be logged in there to view the posts of others, just needs to be logged in if you are planning to post any new query at STACK Exchange. Don’t worry, Stack Exchange too have their mobile app for different mobile platforms. Go and download the same from respective application download location. By this we mean, Android users can have the app from the Play Store and iPhone users can have it from iTunes. Visit this Goldmine of Information, the Stack Exchange NOW. That’s all we have related to the Online Community Websites. If you think any Qualified Website has been missed out to make. Please inform us the same, We will review it and will add that to the list if eligible. To get the complete list of these community websites, please refer to this Wikipedia Post. Thanks for your readings, God Bless Everybody. Good insight on the community websites.